I have plenty of millipedes in my garden, I am planning an aquaponics system (starting to build it). Are millipedes suitable food for Tilapia? I worry that the hard shell will damage their intestine. 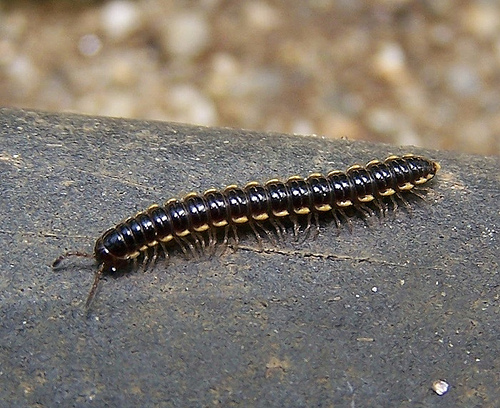 This looks like the yellow spotted millipede, which exudes cyanide as a self defense. Some people will smell the cyanide, which smells like almonds when handling these millipedes, though not everyone is able detect it. I don't know what the exposure would be to a fish eating one of these, but studies have been conducted on the effects on tilapia of environmental exposure to cyanide. The risk might be a moot point, however. The black and yellow markings signal potential predators that this "bug" might not be good to eat - the fish might avoid them. At any rate, it doesn't seem like it would be a good idea to feed these to the tilapia in your aquaponics system.